The Fabulous Ones. Jackie Fargo Introducing The Fabulous Ones. The Fabulous Ones vs. Bobby Eaton & Koko Ware (11/27/82). The Fabulous Ones vs. Bobby Eaton & Dream Machine (Late 1982). The Fabulous Ones vs. The Moondogs (4/4/83). Pro Wrestling Warehouse! the item you will get. This is the only one we have. that item. We hope to get to list more. creases on them. are still in very good. Most of these classic pin. This is the only one we have. creases on them. We have hundreds of other. very good condition. 1984 WRESTLING's MAIN EVENT MAGAZINE. This item is a must have addition to your collection. Nunc pellentesque blandit lectus, at semper massa sodales vel.Hyperlink. Three hours of action featuring Stan Lane and Steve Keirn as The Fabulous Ones. See such stars as Jimmy Hart, The Moondogs, Sweet Brown Sugar, The Assassins, Tommy Rich, Eddie Gilbert, Kareem Muhammad, Jonathon Boyd and many more. AND STAN LANE & STEVE KERIN THE FABULOUS ONES! YOU GET THREE SIGNED APROX 8X10 PHOTOS! YOU GET SIGNED PHOTOS OF. They have! No ifs, no buts. This is a 1985 Remco AWA Wrestling action figure measuring approx. 6" tall. This figure is The Fabulous Ones Steve Keirn. He is in very good overall condition. This is the loose figure only, as shown. USED action figure in worn condition. RARE 1985 REMCO AWA See photos for exact item. Stan Lane vs Shiek Adnan El Kaissey. 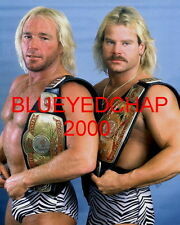 Plus squash matches, interviews and music videos of theFabulous ones. Fabs get attacked by Bockwinkel and Saito. Condition is as shown in my pictures. Sold as is. These wrestling figures are pre-owned and in played with condition. Their joints are loose and there is paint wear. Please see all photos and if you have any questions ask before purchasing. I only ship within the United States (this does include countries that are listed in the Global Shipping Program). I will gladly combine shipping cost on multiple items purchased. Payment is appreciated within 3 days of auction ending. I will post positive feedback about our transaction when payment is received. I hope that you will do the same when you receive your item. Thanks for looking and happy eBaying! Vintage Remco Wrestlers Lot of 3. Fabulous Ones (Steve Keirn and Stan Lane), and Rick Martel . Condition is Used. The right peg to attach the suspenders is broken off on both figures. Still can attach to middle peg.